Sunday services are in the Sanctuary. 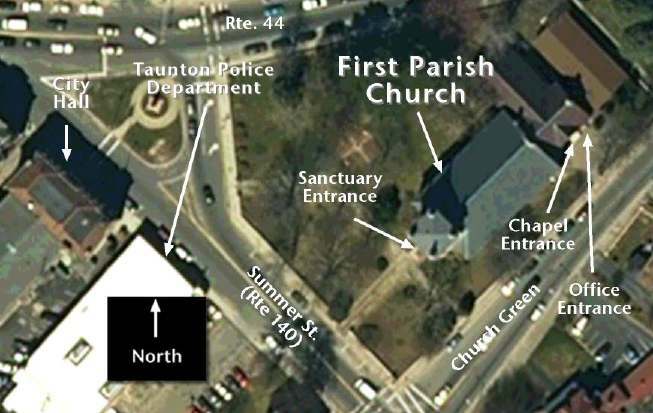 Enter the Sanctuary either by the side door off of Church Green (see photo diagram, above,) or through the front doors, on Summer Street. Parking can be a challenge here in downtown Taunton, but we do have some excellent options. You may park on Summer Street or Church Green, or on either side of the road directly across from the chapel door on Church Green. This little road serves as the driveway to a medical building that is now largely unused; we have permission to use the parking lot of this building, so feel free to park there. You may also park (after 5:00 PM weekdays and/or on Sunday mornings only) in the parking lot of the Old Colony Historical Society, just across the street from the chapel entrance. From the South (Lakeville, Assonet, New Bedford): Rte. 140 North to the intersection of Rte. 140 (Summer Street) and Spring Street. The church will be just ahead of you and on the right. From the North (Brockton, Bridgewater): Rte. 24 South to Rte. 44 West. Take Rte. 44 West to Church Green (look for flags and large fountain.) Take the left-hand fork at Church Green; the church is on the right at the top of the Green. From the East (Plymouth, Middleboro): Take Rte. 44 West from the Middleboro Rotary. Take Rte. 44 West to Church Green (look for flags and large fountain.) Take the left-hand fork at Church Green; the church is on the right at the top of the Green. From the West (Providence, Attleboro, Rehoboth): In Providence, take 95 South to 195E. Take the Taunton Ave Exit in East Providence. At the end of the ramp, turn right and go through downtown East Providence. Follow signs for Route 44. Stay on Rt 44 until you reach Taunton (about 20 minutes). Follow Rte. 44 around the Taunton Rotary and continue to the intersection of Rte. 44 and Rte. 140 at Church Green. You will see the church directly ahead. Take the right hand fork onto Rte. 140 North (Summer St.) and take the first left onto Church Green.